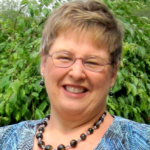 I am so pleased to have Joanie Shawhan as my guest blogger today. Joanie and I met two years ago at a WordGirls Writing Retreat Weekend. Joanie is a survivor of ovarian cancer – so she knows first-hand about what she writes. Despite my background in oncology nursing, I missed the whispers of ovarian cancer. Over the course of several months, I experienced nausea, mistaking these episodes for the flu. Fleeting thoughts of ovarian cancer crept into my mind, but I dismissed them. I rationalized. This nausea is too infrequent to be ovarian cancer. But in September 2006, I rolled over in bed and felt a hard grapefruit-size mass in my abdomen. The whisperer roared. My doctor thought it was a uterine fibroid, but we needed to schedule an ultrasound. In the darkened room, the ultrasound technician furrowed her brow and shot me a glance. Something was wrong. After examining the images, my doctor announced her verdict—ovarian cancer—the size of a cantaloupe. She rattled off the tests and surgery that needed to be scheduled. Words spilled over her lips, sounding foreign and distant. I sat numb, frozen. Is she talking to me? I had witnessed the devastating side effects of chemotherapy suffered by my patients, and vowed that I would never undergo chemo. But now, I felt powerless to carry out this resolution. The side effects of the drugs terrified me: baldness, fatigue, body aches, nausea, vomiting, and a life-threatening allergic reaction. My nursing scrubs and shoes gave way to tieback gowns and skid-free gripper socks. I was one of them, dragged through the theme park of cancer. Today, I am cancer free. I lost myself to ovarian cancer, but in losing myself, I found a new purpose and calling in my life—to advocate for and educate women regarding ovarian cancer. One way I do this is by writing encouraging articles for women undergoing chemotherapy. Previous postWriter, Do You Want to Break into the Homeschool Market?